this week the Baystate runners will do their 22, the Chicago runners will finish up their training, and a slew of you will put some finishing touches on your fall half training. The route will start going North on Maine Street where you can share another moment with Clarence DeMar. Turn left at Melrose Steet onto the Lynfells Parkway, to the Fellsway East, turning right on Highland Ave and getting to water stop 1. Go around the backside of Spot Pond and turn left at Friendly’s making your way to the water stop at Eugene Drive. Then head down Forest turning left on the other Highland and run all the way to the end for another water stop. After that stop go left on RT38/Main Street, right on Playstead, right on Mystic Valley Parkway, right on Bacon, left back on Mystic Valley Parkway. Look for water along the right side of the road. After that continue to the second set of lights, turn left on Washington, continue to the Ginger Bread Construction Company where you turn right to head back up Forest to Eugene. Stop for water again. Next head back to Friendly’s, continue straight, past the Stone Zoo, left on Pond down to Grimsby’s where you turn left. Follow he LynnFells Parkway past Melrose High, turning right on Melrose Street and right on Main Street. Finish up at Brueggers and start your taper with a bagel. If you’re running Chicago run the 12 in the short route map. After the first water stop you’ll loop Spot Pond back to the first stop and the finish up by turning on to East Border Road and left on the Fellsway East. Turn right on West Wyoming and left on Main to finish up your training. Good luck in Chicago! Half trainers, if you want to do 9, after the first water stop head around Spot Pond with everyone else but turn left on Pond and head down West Wyoming turning left on Main to finish up. Water Stops. Lois has an army of volunteers ready to assist you. Thanks to all that donate your time to make this club and this training as special as it is. Thanks Lo! Week 12 – Someone’s running 22! Lois will be helping you out this week. Run long, run hard, taper is coming! Who’s in? As we make our way through September, there are a lot of miles flying by as we make our way to Baystate and Chicago, and also for all the great halfs coming up over the next month. The plan for this week is that I’ll be at Nick’s Pizza for the whole morning. Whatever distance you’re running, swing by there every 4 or 5 miles and grab a snack. Write your name on a cup when you pass through the first time. When you aren’t coming back anymore throw your cup away. When all the cups are gone I’ll head home. 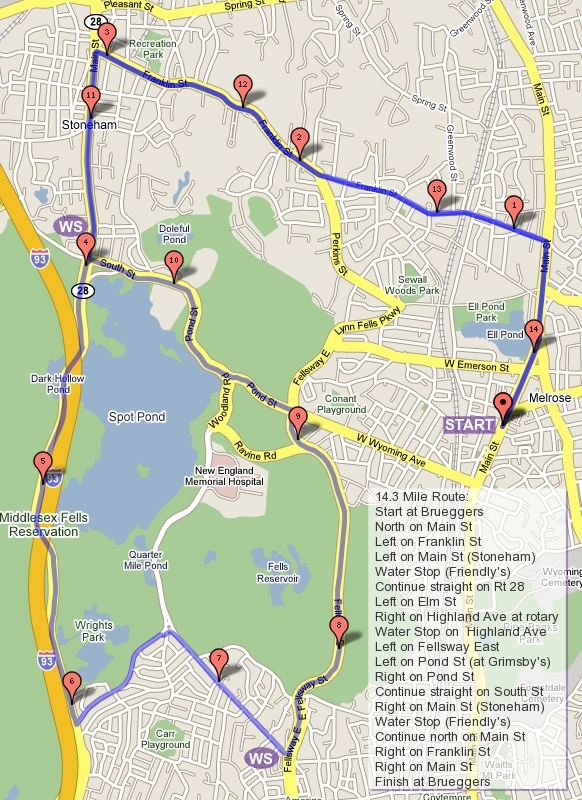 The planned route is as follows: Run up Main Street, past Ell Pond where you say hi to Clarence DeMar. Continue north on Main Street into Wakefield to the intersection of Main, North Ave, and Nahant. Nick’s Pizza is on the right, after Dunkin Donuts. Grab a drink. Continue running up Main Street until you get to southern end of Lake Quannapowitt. If you’re running short you’ll turn left there on Church Street, following to North Ave where you turn left to bring you back to Nick’s Pizza. Follow Main Street back to Melrose to finish up your 8 mile run. If you want more like 10.7 miles you can loop the lake with the long runners. They’ll stay on Main Street running the east side of Lake Q and run almost a complete loop of the lake counterclockwise: left on Lowell Street, left on Quannapowitt Way, left on North Ave. Follow North Ave straight back to Nick’s Pizza. After that water stop the plan is to run Nahant over to Wakefield High School. Cross Farm Street and run up by the Voc on Hemlock Road and through the parking lot straight through to the entrance of Breakheart Reservation. Run a counterclockwise loop of Breakheart by staying to the right as you enter, running the hills first, use the bathroom or water fountain at the headquarters as needed, continue around to the left and then bearing right as you come to the beach area. Watch for the Voc on your right and pop back out into the parking lot, down Hemlock, over to Nahant and back to Nick’s Pizza. To finish a 16 mile run take Main Street back to Melrose to finish. To do a 22, find yourself a nice 6 mile loop that brings you back to Nick’s. One option using streets we’ve trained on before is to head up Main Street to Wakefield Center, turn right onto Water Street (Rte 129), follow to a left on Montrose which will bring you to Lowell Street. Turn left on Lowell, follow it up to Lake Quannapowitt bearing right at a fork of Salem and Lowell streets along the way. Once at the lake turn left and follow Main Street back to Nick’s. That’s just one option. However you go I’ll wait for you at Nick’s Pizza. As far as water stops go, I’ve got this. There is one water stop and I’ll take care of it. This will be my last week of water stopping you this season though. After this week your trusted Lois will take you through to the finish of the season. Week 10 – 20 Miles! With the extra week, the 20 miler is falling on the same day as the Victorian Fair. This rarely happens. Typically we move the start of the 16 mile run earlier by encouraging runners to pre-run 5 miles before 8AM so they can get back to Melrose in time to help with the course marshalling of the race. That won’t happen this year, with the extra week of training, the 20 mile run is this week and it doesn’t lend itself to staggering the start time The 16 mile run is easy to plan varied starts and distances as the route only has a single water stop visited several times. Because there are so many water stops in the 20 mile run, and since cutting off an hour still won’t get you back to Melrose for the 10am race start, we’ll go with our regular start time of 8AM. Also note that Main Street will be closed at 8AM between Grove Street and Essex Street. Last week we had 20 people say they were coming to the SLR, then 35 people showed up. Please let me know you’re coming so I have enough water. Thanks to Brian Walfield for running to the supermarket to get more water. Also a big thanks to both Brian, Tom Gorman, and Hank Murphy for standing out in the rain to support the water stops. This week, as mentioned, is the 20 mile run, or 10 for the half marathon trainers. The route will be another trip out to Winchester, but will venture even further out to the edge of Arlington. We’ll start down Main Street, past Dunkin Donuts, to a right on West Wyoming. Take that past Grimsby’s and up to Spot Pond where you’ll turn right. Continue past the Stone Zoo, past Friendly’s, straight on to Park Street. After you pass the I93 on-ramp you’ll come to a set of lights where you’ll turn left on Marble Street. Take that over I93 into Winchester to the water stop on Eugene Drive. After the water stop continue down what is now Forest Street to Highland Ave where you turn left. This will take you past Winchester Hospital and this week you’ll continue straight on Highland (no Reservoir Rd this week). If you’re running long keep running straight until you hit the water stop at the end of Highland Ave. If you’re running short you’ll turn right on Eaton Street, there is a little park there. Eaton will take you down to Washington Street where you’ll turn right. Continuing your shorter route by running on Washington until you get to the intersection with Forest Street at the Gingerbread Construction Company and turning right to run up a series of hills back to the Eugene Drive water stop. The shorter route runners will finish up by running back to Brueggers the way they came: Forest becomes Marble, turn right at the first set of lights onto Park, past Friendly’s, past the zoo, left on Pond Street down to Grimxby’s, straight onto West Wyoming, and then left on Main to finish up. The longer runners will leave the Highland Ave in Winchester water stop by going left for the first time this season. Follow Main Street/Rt38 into Medford. Cross over to the right side of the road, watch for Oak Grove Cemetery on your right, you’ll turn right on to Playstead Road, a wide boulevard-type road that runs along the entrance side of Oak Grove Cemetery. Follow Playstead to High Street where you’ll turn right at the commuter rail station. Notice the Dunkin Donuts on High Street, a convenient restroom stop. Follow High Street to Mystic Ave, being careful NOT to fork right at Grove Street along the way. High will come to a little rotary at the Mystic Valley Parkway. Do NOT go over a bridge into Arlington or you’re 2o mile run will become a lot longer. The Mystic Valley Parkway will take you along the Mystic Lakes. Enjoy the scenery. The road will seem to end at a T intersection with Bacon Street. Turn right on Bacon and then take your next left on to Mystic Valley Parkway again. Watch for a water stop along the way, typically on the right side by the track in Winchester. After this water stop, continue on the Mystic Valley Parkway through a set of lights and then turning left at the next set of lights on to Washington Street. Continue on Washington as you go through the 5-way intersection at Mt Vernon Street. Cross Mt Vernon and stay to the right on Washington. If you pass Winchester High School you went the wrong way. If you pass a few churches you’re on the right track. Continue on Washington to the Gingerbread Construction Company, turning right there on Forest Street and then up, up, up to the Eugene Drive water stop. After this water stop you’ll go over I93, right at the lights onto Park Street, over to Friendly’s and then right at Main Street in Stoneham. This will bring you around the back side of Spot Pond (I know, again) to the left at Elm Street and up to the Highland Ave rotary. Go right onto Highland Ave this week and find the water stop in its usual place. After this water stop continue on Highland to the traffic circle at the Fellsway East. Go left here, following the Fellsway East to Grimsby’s. Turn right there on West Wyoming, back to Main Street in Melrose where you’ll turn left and after passing Marathon Sports, finish up in glory down the center of Main Street to the horror of all the Victorian Fair-goers. Water Stops. I need a minimum of three water stop people this week. One stationed at Eugene Drive, one to cover both Highlands (Winchester near Medford first, then Medford near Malden second), and a Mystic Valley Parkway at McCall Middle School. Who can help? Hank? Tom? When training started back in early July I neglected to verify the date of the Baystate Marathon, this resulted in an extra week of training for those running Baystate. This week we run the extra week’s route by repeating Week 6’s route. Typically we step up two weeks in a row at this point in the training, but this allows for a step back week if it’s Baystate you’re running this fall. The route itself was a challenging hilly run on a very hot day, leading to a lot of long faces back at Brueggers. Tomorrow the hills will still be there but the distance should be a bit easier for you and the temperatures are going to be much cooler, with a possibility of a little rain. This will be your first taste of what should be expected for a Fall race. The route is going to start up Main Street past Ell Pond. Continue up past Whole Foods, taking a left onto Franklin and heading into Stoneham. After passing Stoneham High School, take a left at a set of lights on to Summer Street. Follow that as it curves around to the right and crosses Main Street in Stoneham and becomes Marble Street. This will take you through a set of traffic lights and up and over I93 to Eugene Drive where water stop 1 is. If you’re running short, after the water stop turn back over I93 and turn right at the first set of traffic lights onto Park Street. This will bring you past the I93N on ramp, around to Friendly’s in Stoneham. Keep following this road past the Mobil station, past Stone Zoo to a left down Pond Street to Grimsby’s. Go left at Grimsby’s onto the LynnFells Parkway, past Melrose High School, right on Melrose Street, and right on Main Street to complete your 8 mile run. If you’re running long, after the water stop continue down what is now Forest Street in Winchester. Turn left onto Highland Ave, and turn left across from Winchester Hospital on to Reservoir Road. Follow Reservoir along the edge of the Fells as it loops back down to Highland Ave. Turn left to continue along Highland to the end where water stop 2 will be. After water stop 2, turn right on Main Street (Rt38) and head up to a rotary. Go around the rotary to the right leaving it at the first major road with the Symmes Farm sign on it to stay on Main Street in Winchester. Stay on the right side of the road and veer off at the fork to get on Washington Street. You’ll come to a 5-way intersection, crossing Mystic Valley Parkway and heading off to the right to stay on Washington Street, passing churches. If you pass Winchester High School you’ve gone the wrong way, head back and try again. Washington Street will continue straight, bringing you to a set of lights at the intersection of Forest Street where you’ll see the Gingerbread Construction Company. Turn right here to run up the Forest Street hills to bring you back to Eugene and another water stop. After water stop 3, take Forest back over I93 and turn right at the first lights at Park Street. Follow this road to Friendly’s and turn right on to Main Street. This will bring you around the backside of Spot Pond, continuing on the road without getting on to I93 (don’t follow the ramp on the left). You’ll go over I93 and then under I93 and eventually will get to the place you turn left onto Elm Street. If you make it to Roosevelt Circle over I93 you went to far, turn around and try again. Elm Street will climb up to the rotary at Highland Ave in Medford where you’ll go left and find another water stop at the Flynn Hockey Rink. After the final water stop you’ll have about 2 miles left to finish up. Follow Woodland Road along the front side of Spot Pond, turning right at Pond Street down to Grimsby’s. Run straight down West Wyoming to Main Street in Melrose, turning left to get to Brueggers. Water Stops: Hmm, not sure if Hank is around to help. If anyone wants to help me out, let me know.